I love to get insider tips from locals when my family and I are on holiday. 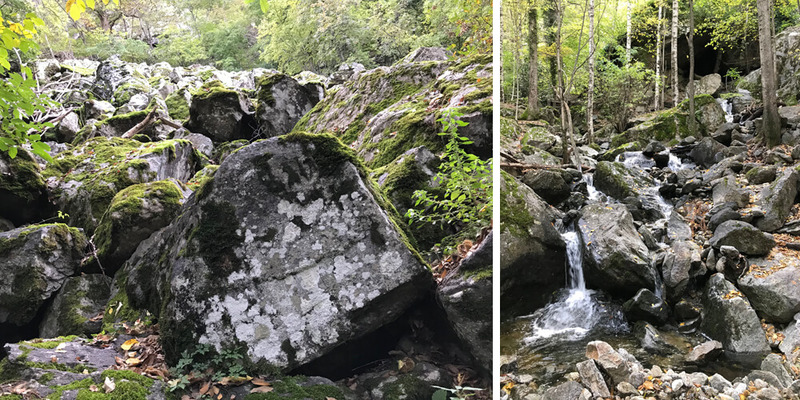 During our last vacation in October, we did a home exchange with a lovely family in the Pyrénées-Orientales department. 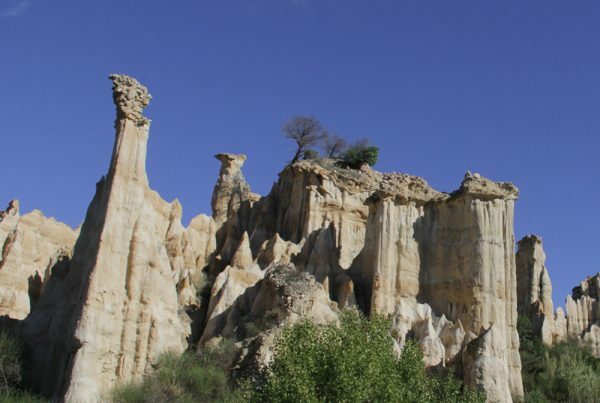 And they provided us with a great list of what to do in their beautiful region. 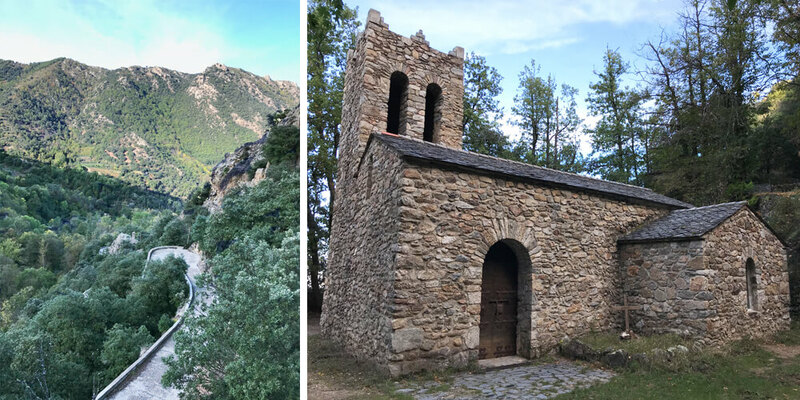 At the top of the list was a hike to the Abbaye Saint-Martin-du-Canigou. The guide we bought had photos of an amazing view, so my curiosity was piqued. As we live near Béziers, where the temperature is a bit higher, I didn’t think of bringing our winter coats. I should have, as the temperature dropped to around 0 degrees when we arrived at the starting point of the hike in Casteil. So there we were, dressed up in our in-between-season jackets, feeling rather chilly. Luckily it motivated the kids to start hiking. Although the walk began with a climb, nobody complained because it warmed us up. Arriving at the Saint-Benoit Chapel, we took a little break and marvelled at the view over the Massif of Canigou. The hike itself was short, 4 kilometres, so soon enough we had reached the Abbaye Saint-Martin… to find it closed, as it was a Monday in the off-season… Because of this, and the fact that we left quite early, we were the only ones in this peaceful place, full of history. The abbey, founded in the beginning of the 11th century, is a hidden gem of Romanesque architecture. The Abbaye Saint-Martin was first occupied by Benedictine monks for eight centuries. After they left, time turned the abandoned abbey into ruins. It wasn’t until 1902 that the convent caught the attention of Bishop de Carsalade du Pont, who started a big renovation project. Father de Chabannes continued the renovations in 1952. And, as of 1988, a new religious community resides in the abbey: the Community of the Beatitudes. As we couldn’t visit the abbey, we decided to climb a bit higher to the viewpoint. 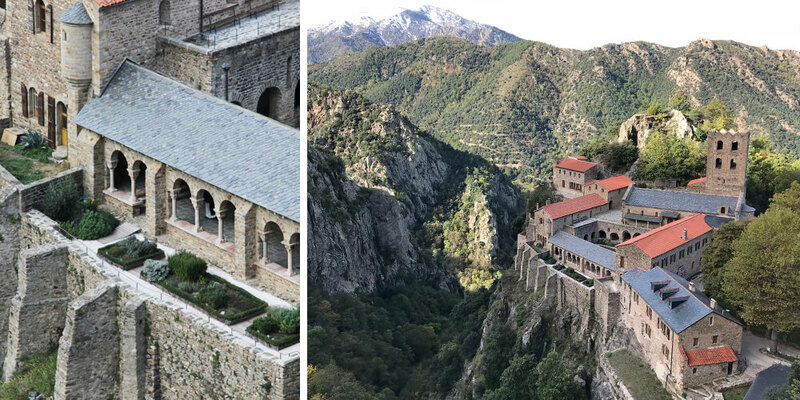 From here, we could get the perfect panorama shot of the monastery, which has been perched up on its rocky pinnacle for centuries. After admiring this extraordinary landscape, we continued on our way through the Massif de Canigou. We walked through a fairytale-like forest. The kids loved the adventurous path which had them climbing rocks and jumping over a (small) river. They also collected loads of chestnuts and spotted a few beautiful mushrooms. When we got back to the car, we were thoroughly warmed up and full of energy from this gorgeous hike. 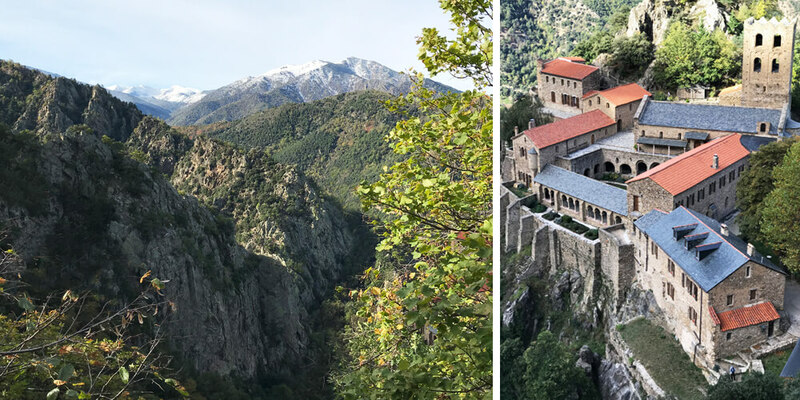 The hike to the Abbaye Saint-Martin-du-Canigou is a 4 kilometres round-trip and takes about 2 hours of walking. The abbey is 1.6 kilometres into the walk and can be visited. 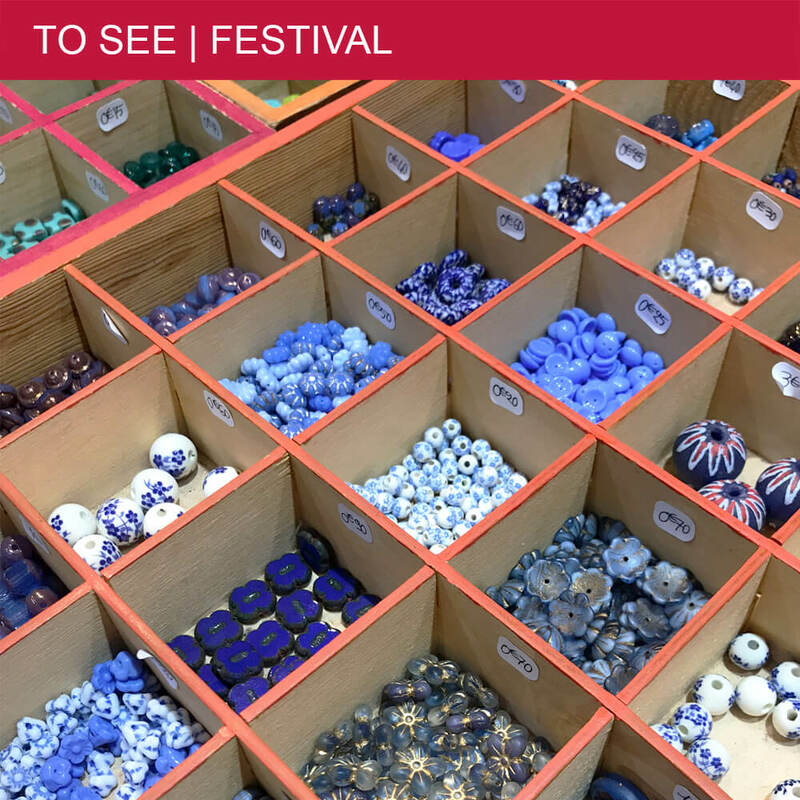 Check their website for opening hours (closed on Mondays during off-season) and entrance fees. Please keep in mind to dress appropriately when visiting the abbey. 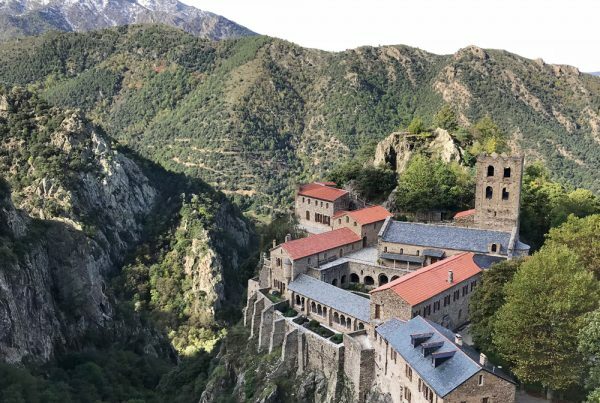 From the abbey, you can do an additional hike to the Gorges de Cadi. 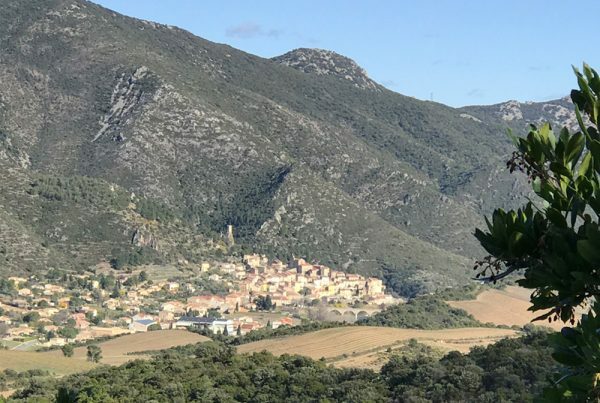 The starting point of the hike is in the small village of Casteil. When you arrive in Casteil, signs will direct you to the free parking. 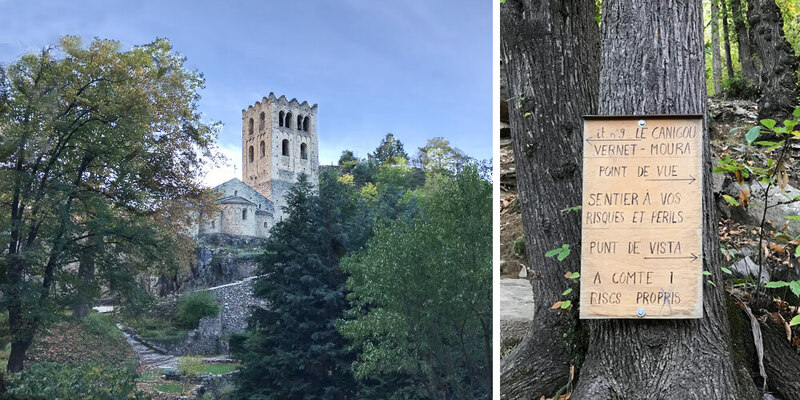 There are a few restaurants in Casteil and a shop with local products next to the abbey, however, they were closed when we were there (October).